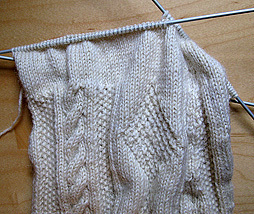 Steady progress this week as I approach the end of the second sleeve; I’ve finished the pattern and am free-wheeling down the inch or so of plain knitting before the cuff. So only a few more rows to go before I can stop counting altogether. (Although I’ve finished the pattern, and no longer have to worry about cabling on the correct rows, I’m still decreasing by 2 stitches every 5 rows along the seam; hence the need to keep score for a little while longer with the old 5-barred gate technique (see picture in week 19)). All things being equal, I’d expect to finish the gansey next week, especially as I’ve started my Christmas holiday early. But I’m going away for the second half of the week to stay with a friend and – exciting, isn’t it? – I’ve got another job interview on Wednesday, in Edinburgh, which is a mere 401.6 miles north of where I live in Somerset. On the face of it, this looks like the job of my dreams, and it’s hard not to get my hopes up, but if I’m honest I must admit it’s a long shot. Still it’s nice to think I’m still in the game, and it would be gratifying to go into Christmas with a great job to look forward to – or any job, come to that – and not have to start making desperate savings just yet (“Chilly isn’t it? Throw another orphan on the fire, Scrunchfist.” “Another orphan it is, sir”). So I may not get much knitting done. I just found your website through Ravelry. Your knitting is beautiful. As a Somerset native now in the US, it’s lovely for me to be able to read about a traditional art in the most beautiful county in the world. Also your drunken man making tea in a power cut is the funniest thing I’ve read all week.